On 2 September 2016, Tibetan monk Jamyan Phuntsok was released from Mianyang prison and returned home. Although he was denied a public welcome by the Chinese authorities, people from neighbouring villages welcomed him in a display of loyalty and solidarity. Chinese authorities had detained Phunstok in 2009 on the basis of allegedly spreading spreading news of Tibetan protests to external contacts and for falsely claiming that Chinese police shot Kirti monk, Tapey, after he had set himself on fire in protest. 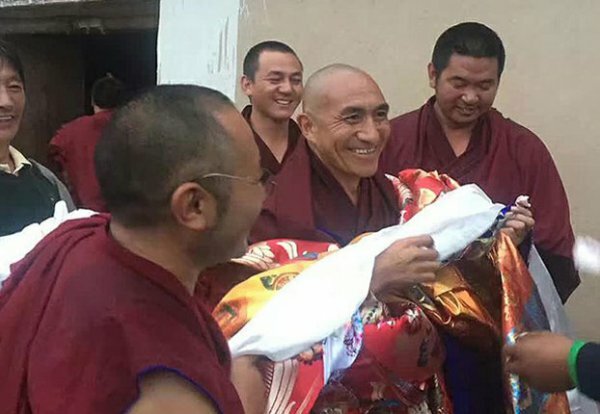 Authorities in southwestern China’s Sichuan province have freed a Tibetan monk at the end of a seven-and-a-half prison term served for activities opposing Beijing’s rule in Tibetan areas, Tibetan sources say. Jamyang Phuntsok, formerly enrolled in Ngaba (in Chinese, Aba) county’s Kirti monastery and also known as Jamkho, was released on Sept. 2 from Sichuan’s Mianyang prison and returned home the next day amid police warnings that no public welcome should be held, a source living in the area told RFA’s Tibetan Service. “However, upon his release, friends and relatives and other residents of [Phuntsok’s] Julu village turned out in large numbers to greet him with traditional offering scarves,” RFA’s source said, speaking on condition of anonymity. “People from nearby villages were still coming to welcome him home on Sept. 3, and he was also invited to a local picnic in a gesture of solidarity and support,” he said. Asked about his experiences in prison, Phuntsok said that things had “not been too bad” for him and that he had not suffered much, but he was visibly more thin following his release, the source said. Phuntsok, then 36, was taken into custody at Kirti monastery by Chinese police on March 3, 2009, on suspicion of spreading news of Tibetan protests to outside contacts, Chinese state media reported at the time he was detained. He was also charged with falsely alleging that Chinese police had shot a Kirti monk named Tapey, after the monk had set himself on fire in 2009 in the first self-immolation protest reported in a Tibetan area of China, China’s Xinhua news agency said.